Mix Green chillie paste and Ginger paste,Lime juice,and Salt in to the churned Butter milk. 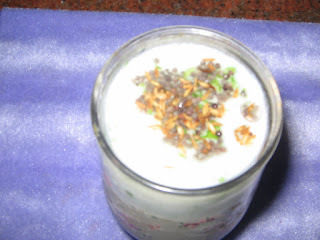 In a Kadai heat onefourth tea spoon Oil,add Mustard seeds,and Jeera and crushed Curry ,Kothmeer Leaves .After spluttering add this Mixture to the Butter milk. The seasoning is optional,you may add or not. Or else just add all the above ingrediants to the churned Butter milk.